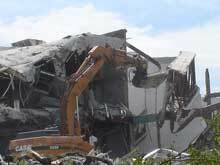 Motivated primarily by environmental concerns, area commercial contractors have been recycling waste from construction and demolition sites for years. But as attitudes and economic conditions have changed, such efforts are beginning to make financial sense as well. In addition, clients are expecting and asking for it. Big Dog Companies jumps up the list of the Southeast's Top Specialty Contractors in Georgia, North Carolina, South Carolina, and Florida by Southeast Construction magazine. When an F2 tornado caused considerable damage to the Atlanta Motor Speedway, Big Dog Companies was able to send several teams of demolition experts to the site within hours. Big Dog Demolition is nearing completion of the demolition at the Macy’s store at the Cumberland Mall located in Atlanta, GA. Every division of the company including Big Dog Companies, Big Dog Roll-Off and Big Dog Concrete Cutting worked hand in hand to produce a turn-key service for the client. Big Dog Demolition then created a temporary barrier against the side of the building so that the patrons of the Mall were not disturbed as the extensive renovation efforts continued. Big Dog Companies is committed to take the environmentally responsible action of recycling and reducing waste. Approximately 280 tons of steel were recycled as a result of the interior demolition and many of the masonry products will be salvaged for re-use for road base at local Atlanta landfills. 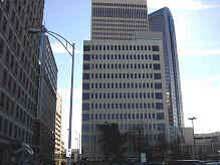 Big Dog Companies has offices in Atlanta, GA, Charlotte, N.C. and Miami, Fl. Below are before and during pictures of Big Dog Companies project for the Wachovia Main Project, in Charlotte, N.C. for Batson Cook. This project is over $1 million and is expected to be completed in a couple of months. Hard-hatted workers have peeled the 12-story Wachovia building at South Tryon and Third streets like a grape, ripping off the walls and leaving gaping holes. This is not the usual new square footage being added to uptown Charlotte, but the transformation of something old into something new. Besides pointing to the future, this rehab reveals architecture's past, specifically how tall buildings came to be. Batson-Cook recently began construction on the renovation of the Wachovia Main building in downtown Charlotte. This $26.7 million project includes an overhaul of both the interior as well as the exterior of the 14-story, 300,000-sq.-ft. office building. The building shell revocation will aslo include the construction of a new skin, new roof, new core and new mechanical, electrical, plumbing and fire protections systems. The contractor will finish out floors two through 14 for use as Wachovia office space. The first floor will be used as retail space. 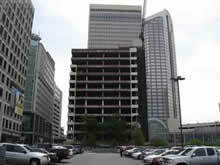 One of uptown Charlotte's blander buildings is getting a makeover. Wachovia will renovate the vacant 14-story building it owns on South Tryon Street, dressing up the 50-year old structure that faces the Wachovia Plaza and adding retail space. 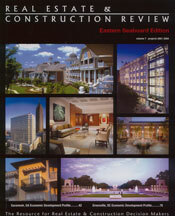 Big Dog Companies is named one of the Southeast's Top Specialty Contractors in Georgia, North Carolina, South Carolina, and Florida by Southeast Construction magazine. Jack Hruska is Bloomingdale's top designer. 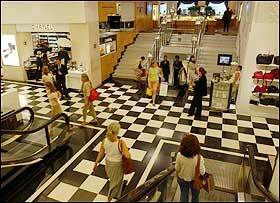 It's his job to transform tired, empty Macy's spaces at Lenox Square and Perimeter malls into new Bloomingdale's. His first order of business in Atlanta: gut both stores. Contractors ripped out every wall and floor and took the former Macy's stores down to shells. "We knew to convert the [former Macy's] was not going to be easy," said Hruska, senior vice president of store design and visual merchandising for the New York-based department store. "We thought we could preserve some of the interior and not do the radical surgery we had to do, but every wall came out."